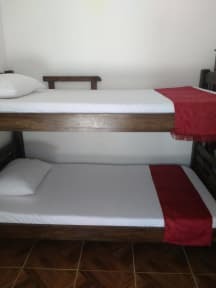 Hostal KAIA i Santa Marta, Colombia: Reservér nu! 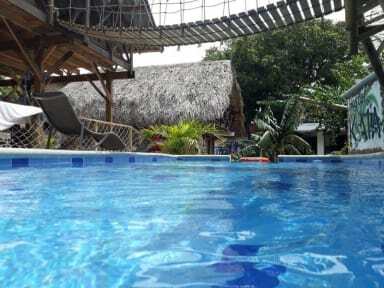 Hostal Kaia is a tropical paradise just one block from the main avenue of Santa Marta, where you can catch the shuttle to Palomino, Tayrona Park,Taganga, Minca, El Rodadero or Airport. Located 2.5 km from the sea and the bay of Santa Marta. Close to supermarkets, inexpensive restaurants, bars and clubs. Hostal Kaia offers you free and fast Wifi, Large public spaces with hammocks, Garden, Swimming pool, Pool table, foosball, darts, Guest kitchen and BBQ. Hostal Kaia is an oasis inside the city Santa Marta. We love the nature and in our garden, you can find hundreds of plants and also wildlife like butterflies, hummingbirds, squirrel and green iguanas. Hostal Kaia is located in a hearth of Santa Marta, just one block from the main avenue which cross the town, and there where you can catch the inexpensive shuttle to Tayrona Park, Palomino, Rodadero, Taganga and Minca. Hostal Kaia is located 2.5 km from the sea and the bay of Santa Marta and about the same distance from Bus terminal. We have two clean and spacious mixed 6-bed dorms with A/C and bathrooms. one large 14-bed dorm with A/C and bathroom and one 7 bed bungalow with fans and bathroom. We also have 2 additional public bathrooms and showers. Check out before 12:00 noon. Loved this place! Great place to come and relax. A really lovely family that just makes this place feel like home. Thank you! !